The Bateaux Dubai Dinner Cruise provides visitors to the Emirate with a unique and memorable way in which to view the older part of Dubai. The two and a half hour cruise departs from just beyond the Al Maktoum Bridge and makes its way along the Creek past many of the city's most famous landmarks. Guests can take advantage of unobstructed views thanks to the non-reflective glass surround and extensive outside deck area. A four course a-la-carte meal is served during the cruise (diners with specific dietary requirements are requested to arrange at the time of booking) and alcohol is available to purchase on board. Musical entertainment is provided care of the Bateaux Dubai musicians and DJ. Booking is required in advance through the reservation line. Opening times: Boarding begins at 7:45pm. Departure from dock 8:30pm. 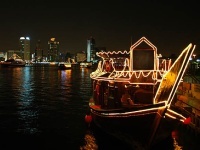 Admission: From AED 495 per person for 4-course meal, welcome beverage and cruise.